But as technology inbound marketing matures and emerges out of its awkward teenage years into adulthood, the challenges that come with it change significantly. We are currently seeing four trends emerge that will change the way you approach your inbound marketing. While your leads are facing more involved and prolonged purchase decisions, it will be your job to support them in their quest as best and most efficiently as possible by providing personalized, targeted information to the right person at the right time. As if technology marketing isn't challenging enough, things just got a little more complex. Sales cycles have increased in length and complexity in the past years. Executives now demand in-depth ROI analysis before purchasing, there are more people involved in the B2B buying process and more upfront information is required, resulting in longer review times. In fact, according to the 2018 B2B Buyers Survey Report (of which one third were technology buyers), 45% of respondents said that they spend more time researching purchases and use more sources to research and evaluate purchases. 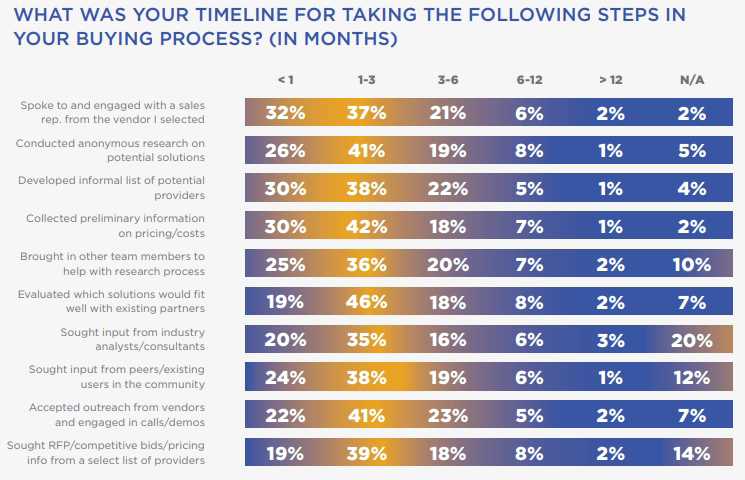 As you can see from the chart above, 41% of buyers conducted anonymous research on potential solutions for up to three months — 19% even required between three to six months for this process. On the other hand, more technology marketers are moving away from defining content based on a buyer's journey. The Content Marketing Institute found that 78% of high-performing tech marketers prioritize providing the right content to the right person at the right time. Instead of providing a one-size-fits-all marketing approach to all of your prospects, strategic-minded tech marketers are now increasingly focusing on personalization, contextual targeting, and real-time usage of collected data to optimize their visitors' digital interaction with the company — which only makes sense as most technology companies are talking about Digital Transformation and improved customer experiences in their own marketing material. In other words, instead of focusing their efforts on one particular buyer's journey, they increasingly practice account-based marketing. This means they proactively find and target large key accounts that could significantly impact their bottom line rather than wait for those prospects to find their own way to them. As you might imagine, the amount of content produced for this kind of specialized customer acquisition strategy is enormous and requires rigorous organization to be sustainable in the long run! 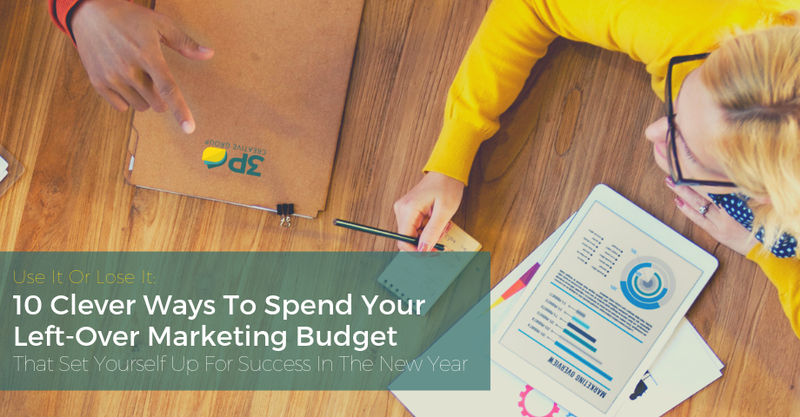 But how do you scale your inbound marketing strategy (and execution) to be able to fit those new needs? How do you organize it in a way that it can be easily found, yet appeals not only to a broadly defined buyer persona, but also to a specific customer profile or a few strategic accounts? 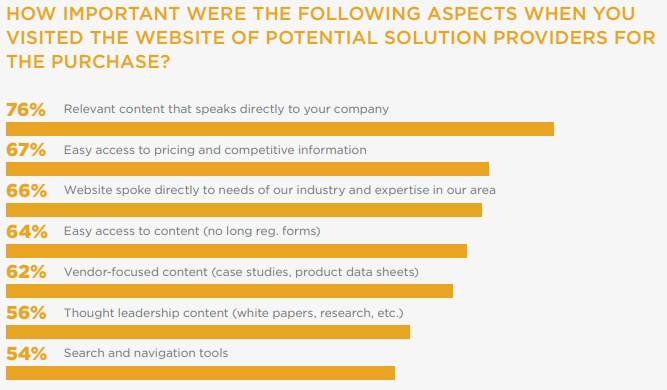 According to the 2018 B2B Buyers Survey Report, 76% of buyers are looking for relevant content that speaks directly to the company (not to the industry or niche in general) and 67% demand easy pricing and competitive information as well as content itself without having to register with long forms (64%). Therefore, technology marketers should begin to familiarize themselves with account-based marketing (ABM), evaluate their fit for this strategy, and consider the implications such a move would bring to their content marketing approach. One of the biggest frustrations of any prospect is not being able to find the answers to their questions quickly enough. This is understandable considering that only 7% of B2B companies respond within 5 minutes while 55% take more than 5 days to respond to an inquiry! The results are detrimental. According to new research, 77% of prospects won't make a purchase on a website that does not leverage live chat. Surprisingly, only 9% of B2B companies are utilizing this functionality although it is readily available and easily implemented. But it doesn't stop there. A 2016 McKinsey Customer Decision Journey Survey showed that 42% might regret a purchase decision and alter their perception about the company they just bought from after not being able to find answers to troubleshooting questions fast enough. 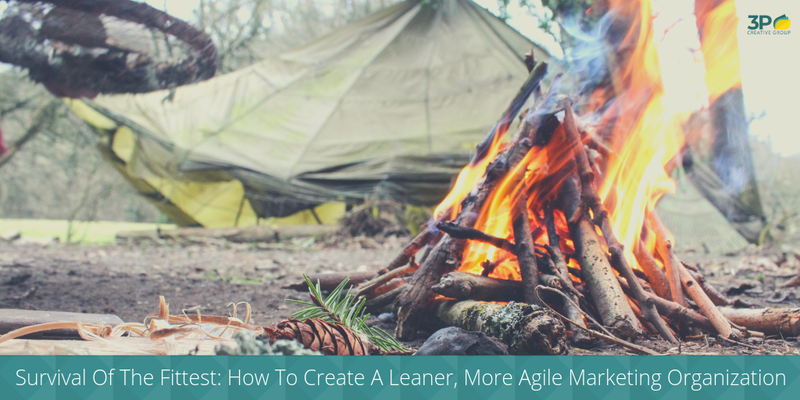 Throwing as many hooks in the water as you can by randomly blogging in the hopes of attracting enough big fish to meet your goals isn't only unsustainable and ineffective — it is also frustrating. In 2019, prospects expect to have helpful, targeted, and contextually personalized information available at their fingertips as to shorten an already lengthy purchase decision making process. Chat bots and other ways to immediately get answers will be a standard requirement for B2B technology websites. Thankfully, there is an alternative to dry, boring tech content! 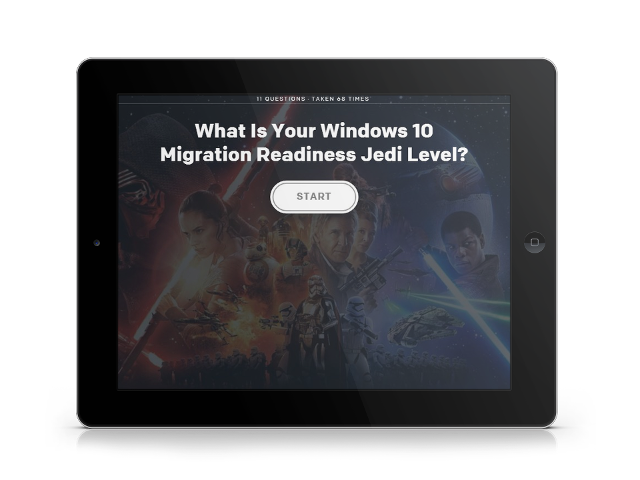 Watch this on-demand webinar to learn how tech marketers can use interactive content, such as quizzes, polls, and lists, to create invaluable assets that not only make their technology solution more attainable but also create a demand for the solution by tackling a user challenge!